We are a Eucharistic community of disciples guided by the Holy Spirit to “Courageously Live the Gospel,” where all are welcome to come and encounter Christ. We strive to advance God’s Kingdom of justice and love through faith filled prayer, compassionate service and the generous sharing of our God given gifts. 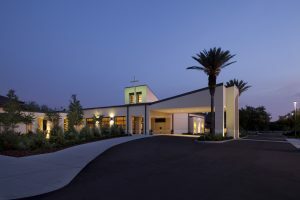 Bishop Thomas Larkin, former bishop of the Diocese of St. Petersburg, made the decision to create a new parish to serve Roman Catholics in the expanding center of Pinellas Country. The new parish’s name was to be St. Catherine of Siena, to honor a beloved visionary who lived and worked for our Lord in 14th century Italy. Before the parish name was chosen, the community was identified as the East Largo Mission. The diocese then gave the project a giant step forward allocating $169,330 to purchase a nine-acre building site on Belcher road, plus loans for the construction of a rectory building and the purchase of a house in the Brookside subdivision to be used as a convent. In 1976, nearly six hundred years after St. Catherine’s passing, Msgr. John Scully, the founding pastor of our parish, took up the mantle of her monumental devotions and set a lofty bar for the spiritual objectives of the new church. Under Msgr. Scully’s direction, a major organizational meeting for a building campaign was held in November of 1976 in the social hall of Synagogue B’nai Israel, north of our present parish. Approximately 700 families and friends set a goal to raise over $ 327,000 to construct a combination Church and Parish Hall. The official groundbreaking of the original church took place on November 23, 1977. The total cost of the new building was $629,880. In the meantime a full schedule of Masses was celebrated in a rental location. 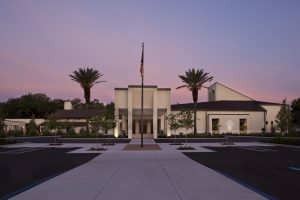 The first Mass was celebrated at the Largo Recreation Center on November 29, 1975, and the first Mass in the new church building was on September 16, 1978. The Office/Rectory and additional classrooms were dedicated on October 14, 1982. 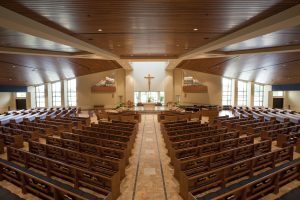 The architecture of the new St. Catherine’s featured a dramatic vaulted ceiling with natural cedar beams. Dominating the altar is a massive mosaic of the risen Christ, custom created by artisans in Italy. Other wooden mosaics depict the “five joyful mysteries.” A statue honoring St. Catherine stands at the entrance of the church, reminding our parishioners of the heritage supporting our daily devotions. Over the years St. Catherine’s has been blessed with the dedicated service of a group of priests and the Sisters of St. Joseph. Msgr. Scully moved on in 1981 and Most Rev. J. Keith Symons was appointed pastor. In 1983 the splendid tenure of Father Michael Finnegan began. Father Michael served faithfully until his untimely death in August of 2005. In January, 2006, the parish was blessed with the appointment of Father Kenneth J. Malley as pastor who served us until June of 2011. Our current Pastor Rev. Msgr. Morris continues to build on the work of his predecessors. The inspired gifts and dedication of St. Catherine’s founding members has left a wonderful legacy. A parish hall and campus that has served our devotional needs for many decades. However, from a few hundred families, we now serve over 4,000 individuals (with 1,825 families that are active and registered). Plus, during the winter time our population swells in the parish and in our parking lots. The needs for space and new facilities have grown in tandem with our church’s population. The groundbreaking for the new church building was April 27, 2008. It was dedicated on April 17, 2010. The Lord has blessed our parish in so many ways. May our efforts in the years to come continue to teach and uphold the spiritual dedication and reverence to the human experience expressed in the life of St. Catherine of Siena.